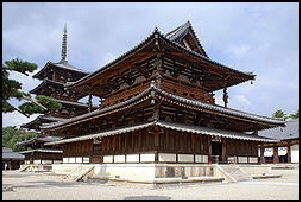 Horyuji Temple (eight miles southwest of Nara) contains perhaps the oldest wooden temple building in the world. Covering 14.5 hectares and said to be founded in 607 by Prince Shotoku, the great protector of Japanese Buddhism, it contains many treasured buildings, sculptures and pictorial art objects. The five story pagoda at Horyuji was originally built in 607. Some have argued it had been unchanged since then, An investigation of timbers use to build the structure indicate the temple was rebuilt after a fire in 670. Examination of tree rings on the timber in the present structure indicate the trees were felled in 663, 631 and 624. The Horyuji Temple grounds are divided into east (Saiin Temple) and west (Toin Temple). The pagoda, Chumanar gate and the Temple of Horyu are the oldest wooden buildings. Among the 55 buildings, which have been declared National Treasures, are the famous Hall of Dreams (Yumedono) , the covered gallery of the Saiian Temple, and 130-foot-high, five-tier pagoda. Kudara Kannon 1 The main hall contains a triad of the Buddha Sakyamuni. Inside the Treasure Housenare the Kudara Kannon and two miniature shrines: the Tamamushi Shrine (once covered with wing shells of jeweled beetles) and the Shrine of Lady Tachibana. Hinoko cypress and Japanese cedar were used to build te main hall, the five-story pagoda and in the inter gate are believed to have been cut down between 668 and 685, which would make them the world’s oldest wooden structures Their ages were determined bu matching the growth rings of the timbers with information gleaned from historical records. Horyuji temple was damaged by fire in 1949. Many of the temple’s delicate, 1,200-year-old works of art---mostly bronze Buddha and bodhisattva statues, nimbuses and reliefs---were placed in the Gallery of Horyuji in the Tokyo Nation Museum. Many of the treasures still in the hands of Horyuji are in such delicate condition they can only displayed on certain special occasions, only for a few hours a day. 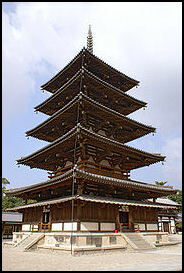 Gojunoto (Five-Story Pagoda) in the western precinct is regarded earthquake-resistant. The five stories oscillate in opposed phases when there are tremors. There is no evidence of the structure ever collapsing. The same techniques are used in modern buildings.Four stone demons---located at he four corners of the upper part of the structure’s lowest roof “hold up” the pagoda. Chuguji Temple (near the East Temple of Horyuji) is a convent, which contains the Miroku-Bosatsu statue, a 7th century wooden Buddha renowned for its serenity; and an embroidered mandala believed to date back to the 7th century and believed to be the oldest example of visual art in Japan. There are some very pleasant walks in this area. A ten minute walk will take you to Horin-ji Temple. Another 10 minute walk will take you Hokkeji Temple, with a famous statue of Kannon, the eleven-faced Goddess of Mercy. Two minutes from there is Jiko-in Temples that features a pleasant garden and a high admission fee. Omiwa Shrine (in Sakuria south Nara) houses a deity of sake brewing. Leaves from the Japanese cedars that grow on the shrine grounds were traditionally hung from all the sake breweries in Japan to mark the arrival of the year's first batches of sake. The shrine also boasts the tallest torii gate in Japan (32.2 meters high). Hasedera Temple (two stops form Sakurai on the Kintensu Odaka line) was built in the mountains, according to legend, on the orders of Emperor Shomu. Enshrined in the temple is 25-foot-tall, 11-faced statue of Kannon. 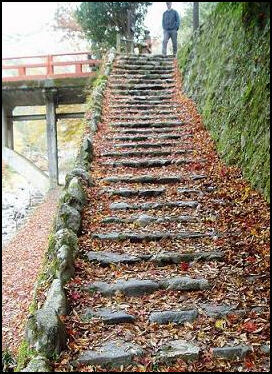 The 399 steps that lead up to the temple is lined on both sides by 7,000 red and white peonies that bloom in April and may. Muroji Temple (in Muromura south of Nara) is regarded as one of the beautiful and beautifully situated temples in Japan. Nestled in the mountains of Nara, it is five stories high and was first built in A.D. 780 and was last rebuilt after a typhoon in 1998. A 30 minute trek will take you several pyramid-shaped sculptures by Israeli artist Dani Karavan in the Muro Art Forest. Imaichi (south of Nara, accessible from Kintensu Yamato-Yagi Station and JR Unebi Station) features a number of streets with classic machiya houses and traditional residences. Several of the houses allow visitors to stroll around inside and see what the interior of a machiya houses is like. Some sell stuff: sake, souvenirs, snacks. Imaichi is a pleasant place to while away a couple of hours and is visited mostly by Japanese tourists. Itabuki Asuka (south of Nara, 45 minutes by train from Osaka) is a wonderful historical area with ancient tombs, Kofun burial mounds, mysterious carved stones, remains of imperial palaces, and temple and shrines, which commemorate important sites. Palaces includes Toyoura no Miya, the residence of Empress-regnant Suiko, used between 592 and 603, and Asuka Kiyomihara no Miya, the residence of Emperor Tenmu and Empress-regent Jito from 672 to 694. The Asuka-Fujiwara area of Nara Prefecture is believed to be the starting point of Japan as a law-governed nation. Designated as a World Heritage Site, it stretches through a village and two cites---Asuka-mura, Kashihara and Sakurai---and covers an area of 24 square kilometers. Hiking rails and bike paths run through the farmland around the area. Many people tour the area on bicycles which can be rented in front of Kintensu Asuka Station. Asukamura villages covers 2,400 hectares and embraces the historic sites of Ishibutal, Takamatsuzuka and the Kitora ancient tombs. 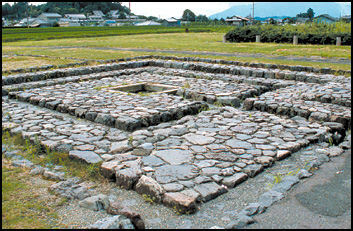 The main village in the Asuka area, it was the capital of ancient Japan from A.D. 592 to 710. During this period eight emperors, starting with the Empress Suiko, ran the state until the capital was moved to Heijokyo (Nara). About 7,000 people live in the village today. Laws prevent them from developing the area in unsightly ways or damaging agriculture or forestry. Many of the residents are very old. Prince Shotoku The Asuka Period (A.D. 592-700), a little-understood period when Japanese culture was developing and defining itself and the first powerful centralized Japanese state was established. Asuka is the name of ancient city (near Nara), where the kingdom was centered. The capital of Japan from 694 to 710 was nearby in Fujiwarakyu, in Kashihara, Nara. The Asuka Period began with accession of Empress Suiko to the Japanese throne in 592 and the establishment of Toyura Palace. 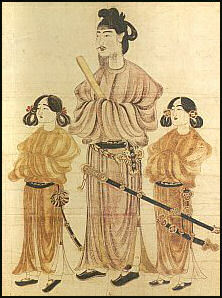 The most important Asuka ruler was Shotoku Taishi (born in 574, ruled 593-622). Regarded as the "father of Japanese Buddhism," he made Buddhism the state religion by constructing major Buddhist temples such as Horyu-ji near Nara. His was goal was to create a harmonious society. Shotoku Taishi (Prince Shotoku) also dispatched an official diplomatic delegation to China, established the Seventeen Article Constitution in A.D. 592 and brought together the priest-chiefs of the major clans into a somewhat centralized government based on the Chinese model. He began asserting Japan's power, and once wrote a letter to the Emperor of China, addressing to "from the Emperor of the Rising Sun to the Emperor of the Setting Sun." Under Shotoku Buddhism became the state religion, scriptures, art and craftsmen were brought in from Korea and Japanese monks were sent abroad to study. Temples were founded, monks were ordained and ceremonies were held publically. Mahayana (Greater Vehicle) Buddhism was introduced in the Asuka period. Mahayana religious themes would endure for over 500 years. 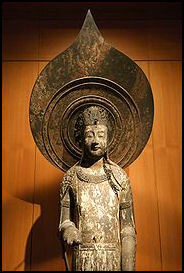 The introduction of Mahayana Buddhism marked the beginning of the development of Japanese fine arts. At this time artisans turned their attention from ceramics and metalworks to Buddhist images, namely sculptures. palace remains The oldest minted coins found in Japan were unearthed at the ancient site of Fujiwarakyu, the ancient capital from 694 to 710, in Kashihara, Nara. The Nihon Shoki---an ancient historical text---contains reference to the of coins in A.D. 683. Among the important cultural legacies of the Asuka period is Manyoshu, a literary treasure containing more than 4,500 poems which provide much evidence on how people lived at that time. A large Asuka period pond, covering 5,000 square meters, found at Asukamura, Nara Prefecture, and believed to belong to palace of Emperor Temmu, is similar to Silla dynasty ponds found in South Korea in the 7th and 8th centuries. Seventh and 8th century tombs in Asuka have revealed images of creatures associated with the points of the Chinese and Korean compass: a blue dragon for east, a white tiger for west, an imaginary Chinese bird for south, and a turtle and snake for north. Many historian believe these tombs provide proof that rulers in the Asuka, and possibly Yamato, periods were either Koreans or Chinese or strongly influenced by Korean or Chinese culture. Many Koreans believe they offer proof that Japanese Imperial family was founded by a Korean clan, something that Japanese nationalists vehemently deny is possible. The earliest works of sculpture were created by Korean artisans. Example of their work remain at Horyuji Temple in Nara and Koryuji Temple in Kyoto. In 1972, archaeologists discovered well-preserved murals inside the Takamatsu tomb at the Asuka archeological site. Dated to the end of the seventh century, the murals contained images of tigers, dragons, and star constellations like those found in Korean and Chinese tombs. The people in some of the murals are wearing Korean-style clothes. turtle rock Asuka has many mysteriously-shaped stone objects, whose original purposes are still being debated by scholars. 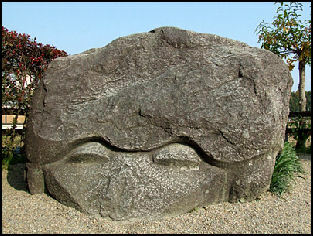 The Masuda Iwafune stone weighs 800 tons and has two 1.3-meter-deep square holes carved on the top. No one knows the purpose of the stone or how it got to the top of the hill where it stands. 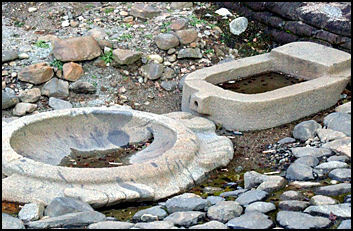 The Kameisha Stone sits in the middle of a rice field. Some say it looks like a tortoise. Others say it looks like a toad. Both of these animal were sacred in the Asuka period yet the purpose of the stone remains unknown. There are four Saruisha (monkey-shaped stones) in Asuka. Three of these have a faces carved on both the front and back of the head. The Sakafuneishi stone is a huge 5.5-meter-long granite rock with pits and channels chiseled out in it. Some have speculated it may have been used to make sake (rice wine). Others say the drainage gutters and round hollows on the top were part of a system of running water. 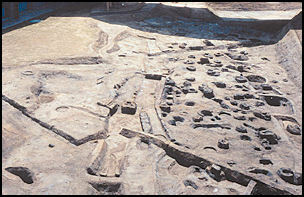 A turtle-shaped stone excavated at the site in 2000 is believed to be part of a structure for pouring and storing water used by people to cleanse themselves before entering a palace. A pattern carved in the stone may be related the position of the sun during the spring and autumn equinoxes. Asuka also boasts a number of impressive burial mounds. Some have been left untouched while others have been carefully excavated. Centuries ago the earthen cover of Ishibutai tumulus was removed, exposing the tomb. At one tumulus, a large cover stone was separated from the base stone. The cover is known as Oni-no-Setchin (Ogre's toilet). The lay-out of the major tombs in the Asuka area seem in accordance with principles of feng shui (Chinese geomacy). The tomb is believed to have been built in the early 7th century for a powerful politician. The burial chamber is 7.8 meters long, 3.4 meters wide and 4.8 meter high. According to legend a fox transformed itself into a woman and performed dance on the tomb. Others claim that traveling performers used it as an impromptu stage. Temples found at Asuka include Asukadera, the first true Buddhist Temple built in Japan, Okadera Tachibanadera, Kawaharadera. Tsubosakadera Temples contains a 20-meter-high marble Buddha. Japanese-language displays can be seen at the Asuka Historical Museum. Asuka Itabuki no Miya ruins are believed to be to be the ruins of the palace of Emperor Kogyoku. The palace is believed to be where Soga bo Iruka, a powerful politician at the time, was assassinated, marking the start in A.D. 645 of the Taika Reforms---a political movement to restore power to the Imperial family form a powerful clan. Takamatsuka Tomb Takamatsuka Tomb (within Asuka) is one of the most important archeological discoveries ever made in Japan. In 1972, archaeologists excavated the tomb inside a 5-meter-high, 18-meter-in-diameter burial mound and discovered well-preserved murals inside and the bones of a male judged to be between 40 and 50 when he died. Dated to the end of the seventh century, the murals contained images of a tiger, snakes, tortoise, dragon, and star constellations like those found in Korean and Chinese tombs. Some mural had images of people in Korean-style clothes, which seems to indicate that founders of Asuka were originally from Korea, something the Japanese are loath to admit. The real tomb is sealed and investigated using cameras on fiberscope inserted through sealed openings in the tomb. But despite the best efforts the paintings have deteriorated and been invaded by mold. Ktiroa tom, built around the same time with tomb paintings, is located about one kilometer from Takamatsuzuka tomb. It was discovered in 1983. A detailed replica of the real Takamatsuzuka tomb, nearly as good as the real thing, has been built nearby and it is open to visitors. In a display case are copies of objects that were found in the tomb: fragments of gold-leaf-covered lacquered wooden coffin, coffin fittings,, copper nails, sword fittings, metal pendants, beads and a mirror with a lion of grape motif. In the mid 2000s, Takamatsuzuka tomb was dismantled, The four panels, measuring 2.65 meters long, 1.03 meters wide and 1.13 metes tall, were moved front their original location and preserved. Iga Ueno (20 miles east of Nara) has three claims to fame. It is the birthplace of Matsuo Basho, Japan's most beloved poet, the home of Ueno castle, the setting for the Kurosawa film Kagemusha, and one of the training grounds for ninjas. Ninjas and Iga Ueno in fact are so closely linked that Iga Ueno's manhole covers have Ninjas pictured on them, some houses are built to resemble ninja residences and sometimes city hall officials walk around in ninja costumes---mostly black for men and red for women. Many descendants of ninjas still live in the town. Iga-ryu Ninja Museum (next to Iga Ueno castle) is broken into the three parts. Visitors first enter a small thatched cottage once owned by a ninja. Women dressed in bright pink ninja outfits welcome visitors and give them a quick tour, disappearing behind revolving doors at the end of their stint. 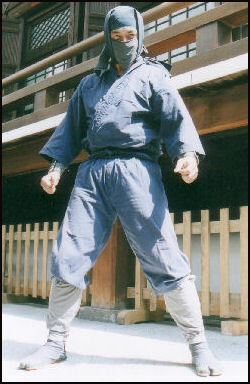 In another room a man in an ordinary suit shows visitors a floorboard that can quickly be flipped up with a karate chop to reveal a hiding place for a sword. The ingenious house also contain trapdoors and secret escape routes. The purpose of these were foil attacks by other ninjas. Hiking Mountains in the Kansai Area include Mt. Hiei and Enryaku-ji Temple, which can be reached by foot or hiking trail. It is possible to take a bus and hike up to Mt. Hiei from the Kyoto side and hike down on the Lake Biwa side and take the train home. The twin peaks of Mt. Horai and Mt. Hira are on the same range as Mt. Hiei. They too can be reached by cable car, or foot. Mt. Atago northwest of Kyoto is a popular hiking area in the autumn foliage season. The trails are accessible from the trains that pass through Arashiyama. There is no cable car to the top but there is a nice shrine there. The summit of Mt. Tenno is a short, steep hike form Yamazaki between Kyoto and Osaka. Mt. Kagaragi and Mt. Kongo, between Osaka and Nara, offer spectacular views of Osaka, Nara and the mountains around Yoshino. Mt. Kagaragi is particularly beautiful in May when the mountain top is covered by blooming azaleas.